If you like what you see here, don’t forget to subscribe to my newsletter in the box above to have my recipes delivered directly to your inbox. Do your kids eat zucchini? Mine will not (or at least my five year old won’t) if it is any form that resembles this green cylindrical summer squash. My oldest swears that there are three vegetables that he will never eat: asparagus, mushrooms, and zucchini. Well, in my house, we do not say “never” about anything! So, always up for a good challenge, I faced his threat head on (without him knowing I was about to be in a head-to-head battle with him) and I decided to attempt to find a way to get him to eat these three nutritionally valuable vegetables without him even realizing it. I tackled the zucchini first. This small summer squash (botanically a fruit, but considered a vegetable in gastronomic terms) contains Vitamin C, lutein, useful amounts of folate, potassium, and Vitamin A. It is one of my favorite vegetables. I love to roast it in the oven with a little olive oil, Italian seasonings, and sea salt or to saute it with tomatoes, lots of garlic, and sea salt. Since Mr. Swears-He-Will-Never-Eat-It will not even touch it in either of these preparations (it is a total texture thing), I had to come up with a way to get around the consistency of it. What better way than to grate them, season them up a bit, and then saute them in olive oil? I turned them into fritters and guess what? It worked! Not having any idea of what he was eating, he asked for three more “Latkes” after he finished his first. He still does not know that he ate nearly half of a zucchini the other night. I may tell him one day soon, but for now, I will keep my secret and know that the next time I am in the mood for this green squash, I have my go-to recipe for us all to enjoy it! I bet you can get your kids to eat it too! This is such a quick and easy vegetable recipe and will be devoured by even the pickiest of palates! Stay tuned, by the way, for my attempts at the mushrooms and asparagus! I cannot guarantee that either will be as successful as our zucchini adventure! I am not even sure why I am so determined to partake in this caper since this is a child who will eat most ANY other vegetable and EVERY green leaf (spinach, kale, chard, mustard greens, arugula). I think that just the mere fact that he puts his foot down so adamantly on these three, is what is fairly amusing to me. But now that I have begun, I will continue my efforts until I have gone three-for-three! Okay, get out your graters and give your families a bit of squash goodness tonight! 1. Grate the zucchini into a colander in the sink. Add the sea salt and toss with the zucchini. Then let the colander sit in the sink while the salt helps to draw the moisture out for about ten minutes. Then squeeze any extra moisture out. 3. Heat the coconut oil in your pan and then drop spoonfuls of the mixture in to the heated oil (about a tablespoon or so each). Flatten each with a spatula, cook about 3-4 minutes per each side, until golden brown. Drain on paper towels and season with salt, to taste. Do you have any secrets up your sleeve to get your kids (or even husband) to eat a particular food? If so share it here! I am always looking for new ideas and maybe someone else will like your idea and have success in their own family!! Also, half a head of cauliflower and 2 potatoes (mashed) usually is a good ratio that still tastes like mashed potatoes. I lOOOOOVE Zucchini Cookies and also my mom got my brother and me to eat acorn squash by making “winter pancakes.” They are soooo good, my mom has the recipe and you could probably call her and get the recipe. Thanks, Em! I may have to get that winter squash pancake recipe from Patti! The funny thing is, he will totally eat butternut squash and pumpkin, and most other veggies, for that matter. There just has to be some texture issue for him with zucchini, mushrooms, and asparagus. On another note, sometime I will have to tell you a funny story about my mashed cauliflower that i made once. It involves Kurt and Carson! I got it!!! I am officially receiving your posts via email, woo-hoo! The fritters look yummy Kim, I love learning new ways to use veggies. With zucchini, I am always stuck on bread/muffins and/or sauteed. 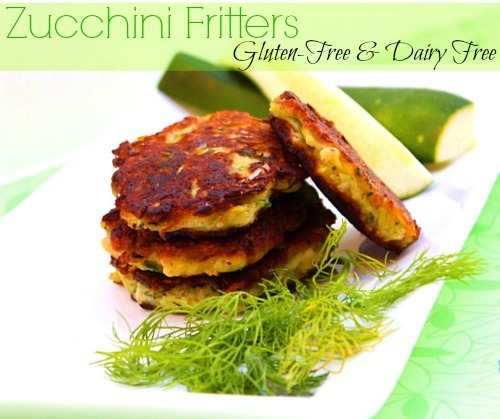 I will definitely try the fritters and I read somewhere to slice them thinly and use in place of pasta in lasagna! Can’t wait to meet you next week! Heidi! Yay! So glad it works and now you get my postst ;0)!! I love this recipe. We all like zucchini but now that I’m getting it in abundance from the CSA I need ideas. Can’t wait to make it. Maybe tomorrow night. Thanks!! Thanks, Nancy! Zucchinis seem to be overflowing everywhere. Everyone seems to be posting zucchini recipes right now! Hope you like them! When my kids were small and I did the same thing. Fritters are a great way to veggies into them. Now they love all vegetables and complain if I don’t make enough each meal. I have to wonder if all those fritters and shredded vegetables I was sneaking into other things prepared their taste buds to love vegetables ‘straight up’ in their teens. Would you do me a big favor? Would you link this up to My Meatless Mondays. This is a recipe people would love to make. There is something about fritters that is very appealing. I am always looking for these recipes that I think would be popular and frankly, I think I get some really good ones. This is my other blog, my non gluten free one but almost every recipe is gluten free, although I leave the baked ones,as is, even if I make them gluten free. They are from groups I bake with. Now you know my life story. Come one over and share your recipe, if it suits you. Thanks. I’m making these tonight – with a few minor subs because I don’t have many dried herbs so I’m using what I have and Bryan can’t have any onions or shallots so I am using garlic, italian herbs and some red pepper flakes – fingers crossed. I am making these tonight. I just picked some squash fresh from our garden. We are new to the gluten and dairy free. So all the help we can get it great. Both mysefl and grandaughter have been tested for gluten allergies and they say we are not but I know we have problems with gluten. So we are going gluten free. She does have a dairy allergy so we have been dairy free for sometime now. Well I did make these. Everyone loved them. Even the kids. until after they found out what they were eating cause the oldest realized after not seeing the squash on the counter got a little upset. But they kept on eating so this recipe is a keeper. Thanks so much it is greatly appreciated. Yay!! This makes me happy, Shirley! So happy you enjoyed them! I made a bunch the other night and then froze all of the extras so that I could have them to just quickly heat up in the pan the next time we want them! Thanks so much for sharing! Happy that Mr GFE and GFE Junior enjoy them too!